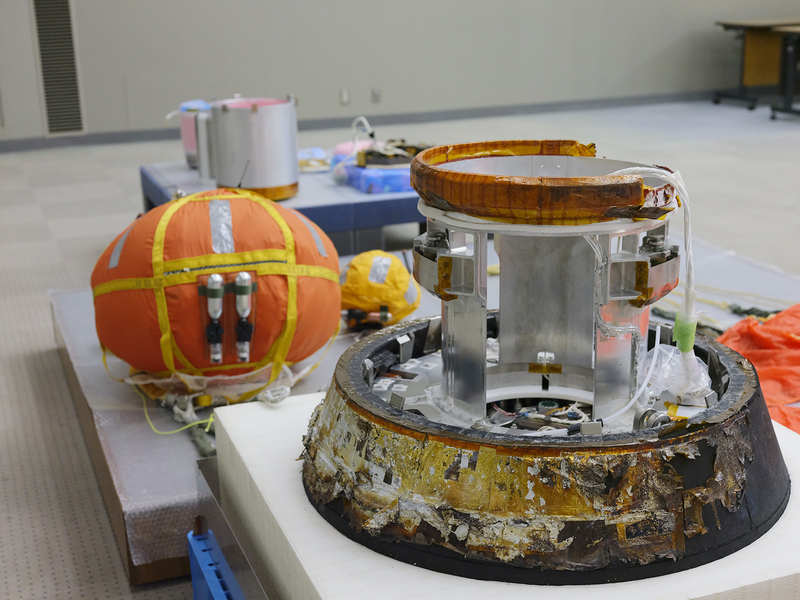 After being subjected to a technical demonstration test and recovered off the coast of Minami-Tori-shima island, Japan, the HTV Small Re-entry Capsule (HSRC) was presented to journalists at JAXA Tsukuba Space Center (TKSC) on November 27, 2018. →The components presented before journalists on November 13, 2018 were presented again. On November 11, 2018, after the capsule re-entered the atmosphere, the lift guiding operation was started at 06:42 (JST). 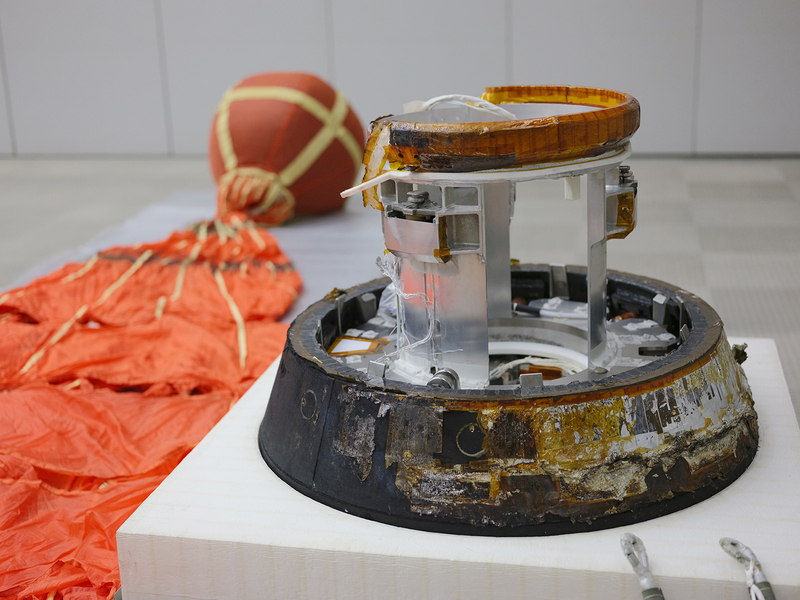 Its parachute was deployed at 06:50 at an altitude of about 15 km and the capsule splashed down to the sea at 07:04. The required acceleration during the lift-guided flight was initially set at less than 4 G, and an evaluation showed that the actual acceleration was 3.5 G.
Among the capsule's Thermal Protection System, the newly developed ablator (based on the CFRP), whose specific weight is roughly equal to one fifth (1/5) as compared to the capsule aboard the asteroid explorer "HAYABUSA", seems to have apparently well proved its performance. Judging by the ablator's wear amount, the maximum temperature on its external surface is supposed to have up to 1700 ～ 2000°C as anticipated. Precise analyses revealed that the temperature rise on the inside of the capsule (ablator temperature) had been less than half of the permissible range. 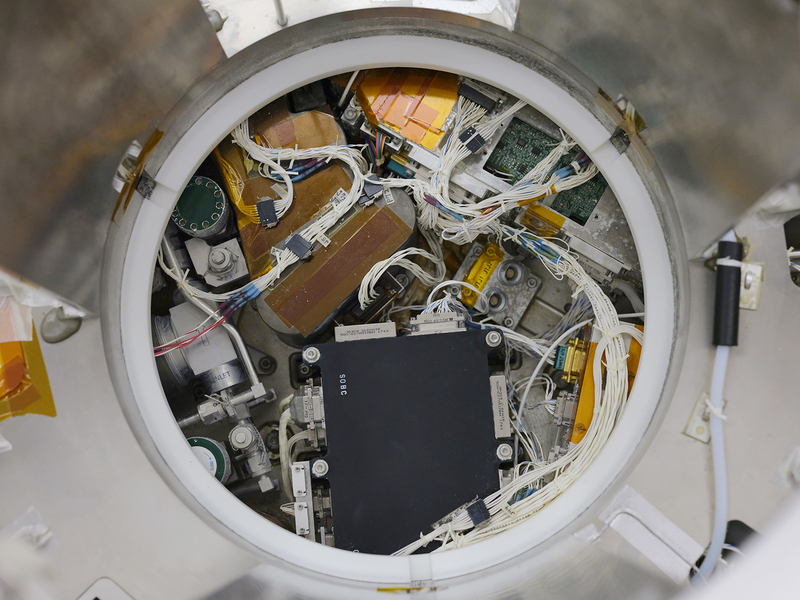 The analyses also revealed that the internal temperature in the thermal insulation payload container mounted in the capsule had been maintained sufficiently under 4±2°C during 5 days and 15 hours as required. Q. What is your general evaluation of this capsule recovery test? We have successfully completed the recovery operation, clearing the steps one by one at the key phases. Even the uncontrollable weather conditions were favorable. 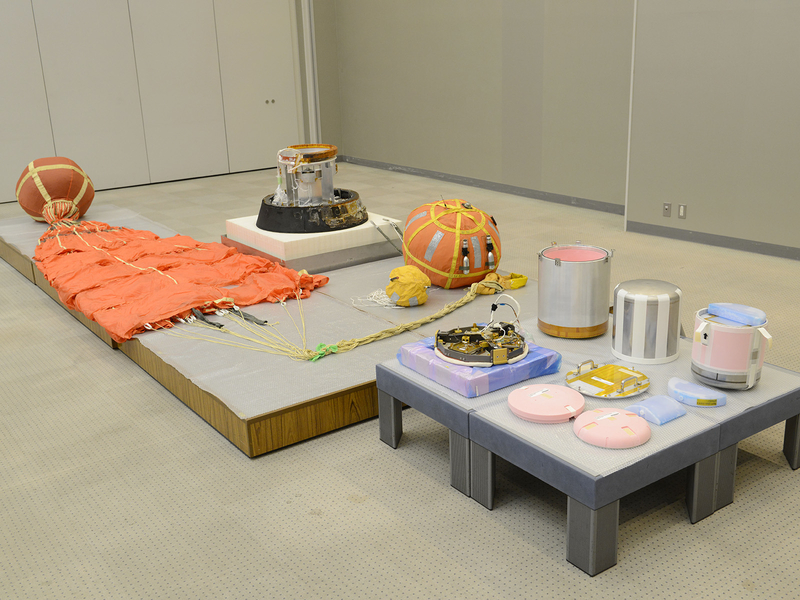 The operation was smoothly conducted, probably because a series of recovery rehearsals had been made before the test. It is a great success. Q. Is the acceleration 3.5 G roughly equal to that experienced in a manned spacecraft? We have confirmed that it was at the level that might be experienced on board a manned spacecraft. But, one single test result, even if it is satisfactory, is not sufficient for developing a manned capsule. Further continued test would be required for that purpose. Q. What is your next plan in your development activities? We have not drawn up any specific plans yet. We would like to invent next a device that is capable of re-entering the atmosphere autonomously. Current capsule design is not capable of re-entering without a KOUNOTORI. We hope to come up with a capsule capable of re-entering the atmosphere on its own after being deployed from the International Space Station (ISS). User's convenience will thus be enhanced. 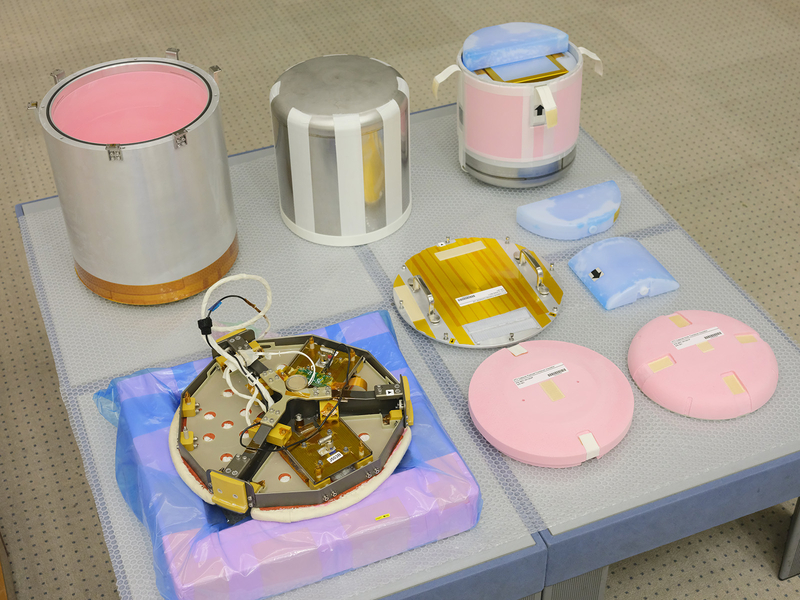 Next advanced model of capsule will probably not be completed before the HTV9 ("KOUNOTORI 9") is launched. It will be implemented in time for the next planned H-II transfer vehicle ("HTV-X"). Q. In what conditions is the ablator after the test? The portion of the capsule which is exposed to the most extreme thermal conditions during re-entry to the Earth is upper part of the re-entry surface. The lateral panel at the part's side lost the completely burnt surface film and exposes the naked material of the ablator. The temperature on the lower-side lateral panel did not rise so much as to completely eliminate the multilayer insulator (MLI). The golden-colored objects are the remaining fragments of Kapton tape which, attached to the capsule's entire surfaces to ensure safety of astronauts, had also worked as refractory films. The silver-colored objects are the remaining fragments of the MLI. The MLI is used as thermal insulation film for protecting the internal batteries in a low-temperature environment on the orbit. Q. Can you reuse the capsule? Since it is in good conditions, we think we can examine whether its components can be reused. Q. What is the smell coming from the black portion of the capsule? The smell of burnt fragments of the ablator is remaining.